I’ll show you mine, if you show me yours, Molly. 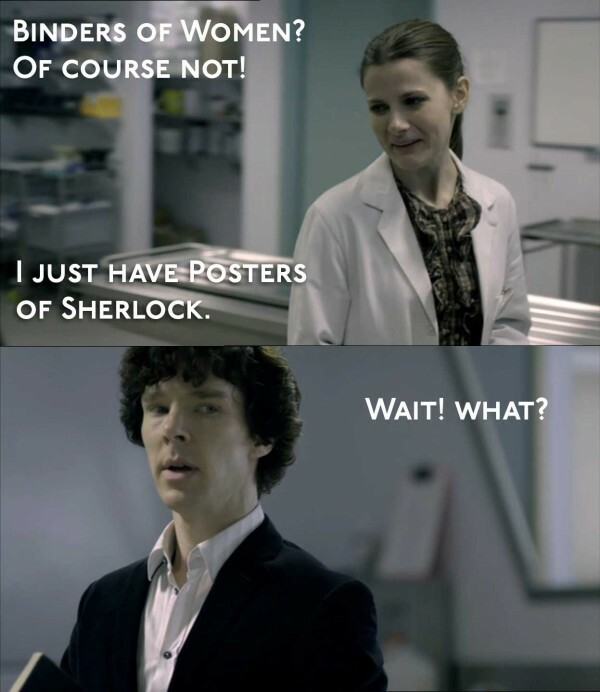 Sherlock, you’re not actually surprised, are you? She’s got a smashing one of you with your riding crop. This entry was posted in Captions and tagged bbc sherlock, benedict cumberbatch, binders of women, Louise Brealey, Molly Hooper, photo caption, Sherlock Holmes on October 26, 2012 by JH Watson. Alexandra – Bahaha, I forgot about The Hills Have Guys. That one was hiroliaus. Enbrethiliel – I don’t remember one that gave away the ending, but maybe I just missed it. Nomadreader – That is too funny… and true for way too many people.